A team of Syracuse University students was awarded first place and $20,000 in the National Cyber Analyst Challenge (NCAC) at Temple University in Philadelphia in April. Syracuse University’s winning team in the 2018 National Cyberanalyst Challenge comprised, from left: Anil Kumar Agrawal, Dheeraj Vijayaraghavan Menon, Michael DiFalco, Priyank Thavai and Sirisha Prakash. 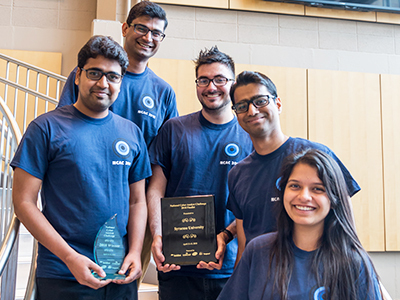 The team was comprised of cybersecurity graduate students Priyank Thavai and Sirisha Prakash from the College of Engineering and Computer Science (ECS) and information management graduate students Anil Agrawal, Michael DiFalco and Dheeraj Menon from the School of Information Studies (iSchool). The students are also members of the iSchool’s Information Security Club or ECS’s Orange Hackers Association. They cite the cross-disciplinary nature of their team as a key advantage in their victory. At NCAC, students are given six hours and a large set of network traffic data to identify the origins of a cyberattack and its potential damage, and then make a seven-minute presentation of their findings and recommendations to a panel of C-suite-level judges from industry. This was the final phase of the challenge. The team had previously advanced through an initial phase in which they won $10,000. The NCAC win is another notch in the University’s belt for cybersecurity. Syracuse was named the top school for cybersecurity in the country by Military Times in 2017 and 2018. Faculty from institutions all over the world rely on security education labs designed by Syracuse professor and team co-advisor Wenliang (Kevin) Du to expand their cybersecurity knowledge and teach their students. ECS offers a masters in cybersecurity, online and on campus, and a cybersecurity semester for undergraduates. The iSchool offers a certificate of advanced study in information security management. This is the second time this academic year that a Syracuse University student team has succeeded at a national competition in cybersecurity. In October, the Orange Hackers Association took second place in the CyberSeed Security Competition in Connecticut. The student organization promotes affinity for cybersecurity, continuous learning and participation in skill-based competitions. Ultimately, the students’ education and participation in competitions like NCAC prepare them for success in the cybersecurity industry—an industry that is consistently seeking skilled employees.